On the first page that I made about this caboose, it says that I thought the caboose is supported by wood, with some sort of steel structure in there. Now it looks like the structure is all large angle iron, with wood fitted in that. The wood no doubt adds some strength; but considering that it's cut from a wide piece of wood, and not bent like a steam bending process, I think the structural value of this wood is limited, compared to the steel. It makes a good place to drive nails to hold the roof and sides on though. On one end of the caboose, the fitted wood had to be replaced. The first picture shows the fitted wood after the facia board has been removed. The next two pictures show the fitted wood and facia board laying on the shop floor. 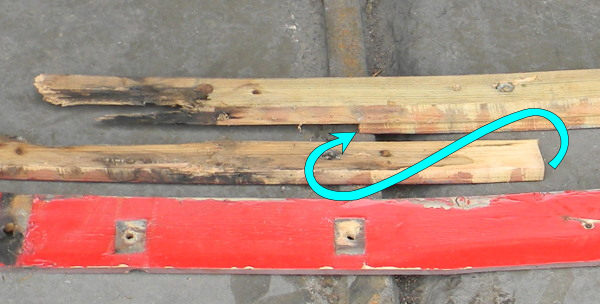 In the second picture, the arrow shows how the fitted boards were arranged. There are two layers of curved cut boards put into the angle iron; the outer one was solid, one piece cut from a 2 X 10. The second layer was two boards; they also appeared to be cut from a 2 X 10, because I found a tag still stapled on the end of one. Why this inner layer was two boards instead of one, like the outer layer, I'm not sure. The inner layer is thinner, only 1 inch thick, whereas the outer layer was the original 1.5 inches thick. It might be that the craftsman was using a circular saw to make this thick rip cut, and didn't want the radius to interfere with the cut. That, or it was just too awkward. A close examination showed that the inner boards were ripped twice to get that 1 inch thickness; I could see this from the saw tooth marks in the wood. I used decking screws to put the layers back together, then used that as a pattern for the new pieces. I bought new wood cutting blades for my old Milwalke Sawzall; and tried cutting the Yellow Pine 2 X 10. the progress was painfully slow, and inaccurate. I was going to have to find somebody with a big bandsaw, or try a different tool. I have done a curved cut with a circular saw before, but wasn't sure if this radius was slow enough. I thought I might need to cut off successfully smaller corners, then finish it with a belt sander; or, jog the circular saw foward and back while gaining more of a curve as I slowly made the cut. Neither option was necessary; I guess the set of the teeth made a wide enough kerf for me to nicely handle this cut. I was very pleased with the results, you can see them in the next two pictures. The only tip I can give is to adjust the blade just deep enough to cut the thickness of the wood. That way, there's less width of blade front to back, to hinder a turning motion. The next picture shows the top of the table saw, with the fence set 1 inch away from the blade; and the inner piece after being rip cut.